We’ve set out to compile one of the most extensive online resources related to pressure washing. You can check out our buying guide to begin learning about the different features to look out for, or head over to our cleaning tips and tricks page for inside and outside pressure washing projects for your home. 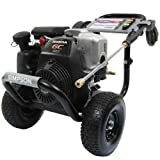 Other than the many pressure washer reviews on this website, you will find lots of useful articles, guides, and tips to help with pressure washing. We also try to review models whenever possible, but we don’t get access to many of them. When we do though, we love to put them through a few tests and document our findings along the way. From the power of the washer to the performance and reliability, we rate them out of 5-stars and provide inside-knowledge into each model. Remember, for a more informed and useful purchase, understanding your needs and what you can expect out of the pressure washer are more important. From washing dirty concrete driveways to repainting the entire house, we’ve come across models which are great, and some which have a bloated price tag. It might be time to look for a new pressure washer or to upgrade to a powerful model, maybe you simply want some pointers to get started with pressure washing – whatever your needs, we’re here to help you meet them! Browse through our list of the 7 best pressure washers on the market. Please click through to read more reviews on these amazing cleaning machines. Finding the perfect pressure washer is never simple or straightforward – not with so many top-quality options out there to begin to choose from, anyway! That’s why we’ve done a lot of the heavy lifting of researching the top pressure washers on the market today for you. We dug deep into the best manufacturers on the planet, their top models, and what helps to separate each of these premier pressure washers from the rest of the pack. Ryobi - Sold exclusively at Home Depot, these pressure washers are compact, portable, and come in both electric powered and gasoline-powered configurations. Don’t let their stature fool you though – these power washers are plenty powerful. Accessories are easy to find at your local Home Depot, too. Karcher - This company invented pressure washers in Europe and has been making them for decades, leading the charge in the field of electric powered pressure washers in particular. German engineering is on full display with these tools, giving you a powerful, consistent, and durable solution you can rely on for years to come. Generac - Favored by homeowners looking for pressure washers that offer plenty of power without the paint stripping capabilities that industrial/commercial tools might bring to the table (though this company has plenty of powerhouse industrial pressure washers, too) the tools made by this manufacturer are flexible and capable. All of their pressure washers are gasoline powered for improved performance as well. Simpson - One of the most popular manufacturers of quality pressure washers on the planet today, Simpson makes such high-quality systems that the folks at Briggs & Stratton, as well as DeWalt, actually outsource the creation of their own pressure washers directly to Simpson! Anytime you have two legends of the power tool industry choosing you to handle the heavy lifting of creating tools that will carry their branding and their reputation you know you are doing something right. Honda Powered - Finding a Honda pressure washer outside of Japan is almost impossible, but 16 of the biggest retro washer brands on the planet use Honda small engines to power their pressure washers – and it’s easy to see why. Honda has a legendary reputation for making high-quality, inexpensive, and durable products and you know exactly what you’re getting when you go with this top tier manufacturer. GreenWorks - Committed 100% to the electric pressure washer revolution, this company offers innovative new technologies and smart solutions while producing electric pressure washers that are close to the power and performance of their gasoline brethren. If you want to clean up the environment while tackling cleanup projects with your pressure washer, this is the manufacturer for you. This is the most important consideration to make. However, you can only make this decision after deciding the power, portability, usage, and application. Pressure washers are rated with PSI and GPM numbers. Each variable measures a specific ability of the washer. PSI measures the pressure of water delivered by the washer and helps to determine the power output. On the other hand, GPM measures the total volume of water delivered by the washer. It tells you how fast a washer can clean and how effective it is in removing debris. Once you have highlighted all the applications you plan for your pressure washer it is time to decide whether you will look at commercial grade or industrial grade washers. Commercial grade washers are cheap and reliable but not blessed with heavy pressure or cleaning prowess. On the other hand, Industrial washers are effective, high in efficiency and have lots of power but they cost a lot. Plus industrial washers are huge with large compressors, tanks and require specialized storage space. Do you need lots of power or are you looking for something that you can carry around the house? Some people want a pressure washer solely for their backyard and home exterior. Others want it to be portable so that they can clean their cars, trucks, furniture and carry it with them to camping trips and the outdoors. The more power a pressure washer has the bulkier and heavier it is. On the other hand, the lighter and portable a pressure washer is, the less power and pressure it generates. Pressure washers operate using a simple mechanism. The pump draws water from a sump or tank by sourcing power from a motor or engine and then increases the pressure of water to the hose or outlet. Now you have to decide on many things here such as whether to go for electric or gas power, the design of the wand and hose as well as the spray pattern you need. Also, consider the necessity of interchangeable nozzles. Having this possibility helps in future to multitask. Size, power or technology alone does not make a pressure washer stand out. Ultimately it boils down to one simple fact – what are your needs? Do you only plan to wash car interiors? Maybe handle your entire pool area and patio furniture? Do you prefer eco-friendly washers or energy efficient washers? These are just a few questions you have to answer. There are many other things to take into consideration but finding out why you need a pressure washer is paramount among them. Different homeowners have varying needs and hence will rate different pressure washers as per personal experience. 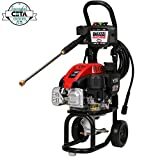 Reviews on Amazon and other sites usually aren’t the best way to select a pressure washer since someone else cannot determine your exact requirements. ​Pressure washers can be classified on the basis of the temperature of water or by the motor it uses. Accordingly there are cold water, hot water, electric pressure washers and gas powered pressure washers. The Gas powered types are portable pressure washers that operate out in the open with greater pressure and increased flow rates for industrial applications. Unfortunately, they can only be used outdoors since the motor produces carbon monoxide, toxic even in the slightest concentrations. Briggs & Stratton makes wonderful gas pressure washers. ​Best For - Industrial applications, regular use, heavy duty application. ​Pros - High power, portability, adjustable pressure and volume of flow. ​Cons - Expensive, costly to maintain, noisy and requires fuel to operate. Electric pressure washers are limited in the total power output and can be used both indoors as well as outdoors. These are usually less noisy and have sufficient power for most commercial uses although the industrial application may not be its forte. ​Best For – Light usage that requires both indoor and outdoor application. ​Pros – Efficient, less noisy, easier to maintain and less moving parts. ​Cons – Expensive, limited by the length of cord, usually bulky in design and non-portable, needs safety precautions as electricity and water do not go well together. Hot water pressure washers use a boiler or heater to increase the temperature of water mixed with soap solution before venting it out at high pressure and volume. This requires a larger engine or motor as it will operate a heating element as well as the pump. They are expensive in comparison with cold water washers but require less soap solution. ​Best For – Washing patio, home exteriors and heavy duty use. ​Pros – High powered, greater efficiency with less expense. ​Cons – Expensive, additional heating component increases cost of repairs and needs caution when handling because of high temperatures. 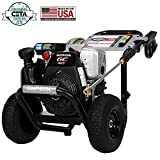 These are the cheapest of all pressure washers and they can run on a small electric motor. Usually, they need less maintenance because of fewer parts and last longer. Also, they are inexpensive with replacement parts usually costing less. However, they need more soap solution and develop lower pressure with a reduced GPM rating. ​Best For – Washing car interiors, furniture and light applications. ​Pros – Inexpensive, less maintenance, run on electric motors and usually portable. ​Cons – Less efficient than hot water pressure washers, need a lot of soap solution and have smaller tanks.